Gael Monfils will get the chance to give France a flying start in this weekend's Davis Cup final against Serbia after Thursday's draw paired him against world number 49 Janko Tipsarevic in the opening singles. Serbia's world number three Novak Djokovic will take on Gilles Simon in the second singles on Friday. Simon got the nod from France captain Guy Forget in front of Arnaud Clement and Michael Llodra who will play doubles on Saturday against Nenad Zimonjic and Viktor Troicki. France are bidding for a 10th Davis Cup title in the imposing Belgrade Arena while Serbia are appearing in their first final in the sport's elite team competition. While the Serbian hopes rest on the shoulders of Novak Djokovic, the world no.3, Gael Monfils, ranked 12th, carries the burden of the French expectations on his shoulders. Djokovic has a 17-6 career singles record since making his debut in 2004. The 23-year-old hasn't lost in five singles matches during this campaign. While in March, he beat both Sam Querrey and John Isner to help Serbia reach the World Group last eight for the first time at the expense of multiple winners USA, four months later he ensured his country booked their berth in the semi-finals by winning both his singles matches against Croatia. He beat both Ivan Ljubicic and Marin Cilic in straight sets. In the semis against the Czech Republic, Djokovic beat Wimbledon finalist Tomas Berdych in four sets to help Serbia edge out the former winners. Monfils, in comparison, has a poor 3-1 singles record in the competition. However, two of those wins - a five-set winner over David Ferrer in the last eight and a four-set triumph over David Nalbandian in the semis - were crucial to his team's fortunes. The Serbians reached the world group for the first time only in 2008 and had never previously gone beyond the first round in the competition's top tier before making this year's final. Serbia's passionate 18,000 fans carried the team in their 3-2 semi-final win over the Czech Republic in the Belgrade Arena, but the French may find the atmosphere less intimidating with the venue's capacity reduced to 15,000 for the final. Also read: Don't write off Federer yet! The Serbian Tennis Association (TSS) released only 5,080 tickets on general sale while the rest have been distributed to various sponsors, tennis clubs, staff and volunteers as well as 1,600 French fans expected to make the trip. Many seats have been allocated for security stewards, press facilities and to install the hawk-eye system. Djokovic had earlier described Serbia's run to the final as "unique opportunity that may never happen again" but has had the distraction of the ATP World Tour Finals before he can really focus on the French. "Playing in a Davis Cup final is the biggest success that my country ever had," he was quoted as saying during the ATP World Tour Finals in London. 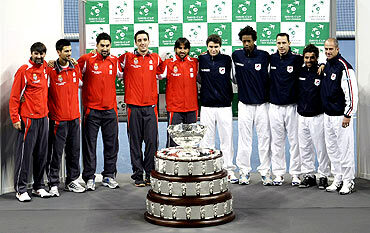 The 2008 Australian Open champion has been the driving force behind Serbia's rise. He has won all his five matches in this year's competition, while also winning titles in Dubai and Beijing and reaching the finals at the US Open. What Serbia lacks in tennis infrastructure it makes up for in raw talent, team captain Bogdan Obradovic said as he labelled his team favourites for next week's Davis Cup final against France in Belgrade. Obradovic said his side have a plethora of options to field. 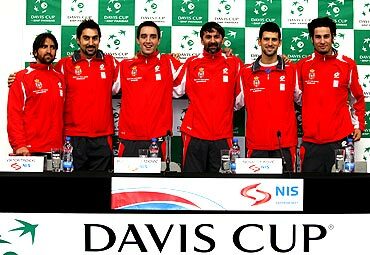 Serbia, who only reached the Davis Cup World Group in 2008, will be looking for their first Davis Cup title when they take on the nine-times winners in what will be the biggest tennis event ever staged in the Balkan nation. "The difference in the tennis infrastructure between the two countries couldn't be starker in France's favour, yet we enter the final as favourites to win because of the individual quality of our players," Obradovic said. "France have the best facilities imaginable and a massive budget to go with events like Roland Garros and other top tournaments, while we have a dozen or so indoor hard courts." The French have a history of upsetting the big guns. In 2001, they won the Davis Cup in Australia, on grass, with Nicolas Escude beating then world number one Lleyton Hewitt. France reached the final this year with a 5-0 rout of Argentina after drubbing champions Spain by the same score. They are still without the injured Jo-Wilfried Tsonga but he will be in Belgrade lending support from the sidelines as compatriots Monfils and Simons battle Djokovic and company. Nine-time winners France are looking for their first title in nine years. Meanwhile, Frenchman Gael Monfils and Janko Tipsarevic of Serbia traded blows in a verbal rally on Thursday, the eve of their Davis Cup final opener. Monfils started off by suggesting his bearded opponent may struggle with the huge expectation on his shoulders after being chosen ahead of the higher-ranked Viktor Troicki. "I think he will be very nervous coming out first in front of the Serbian crowd," the world number 12 told reporters of a player better-known for his wrap-around sunglasses and Dostoyevsky quotations tattooed on his left arm. 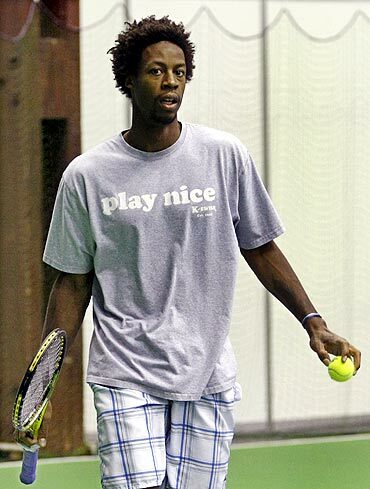 "I'm happy to play first," Monfils said. "If I bring the first point in it will put more pressure on Novak and Gilles can play a better match if we're 1-0. So I think it's good for the team. "I will try to be very relaxed and play my game. Of course there is pressure but that's all part of the game," added Monfils who is undefeated in his team's run to a 16th Davis Cup final. Tipsarevic, given a singles slot behind world number three Novak Djokovic who will face Gilles Simon in Friday's second rubber, laughed off Monfils's comments. 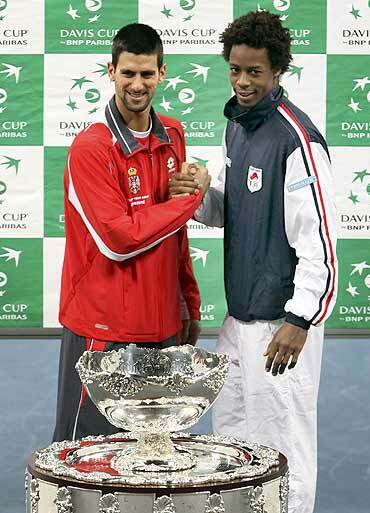 "If Gael thinks I'm going to be more nervous than him in front of 18,000 Serbs he better think again," said the recently-married Belgrade resident who made his Davis Cup debut for the former Yugoslavia in 2000. "Of course we are both under pressure and he is no doubt a very good Davis Cup player but I honestly don't think he can be completely relaxed in front of a passionate home crowd." World number 49 Tipsarevic clinched Serbia's place in the final for the first time with a decisive victory over Czech Radek Stepanek in September. That tie also took place in the imposing Belgrade Arena which has become a fortress for the home team. France captain Guy Forget had toyed with the idea of playing Michael Llodra or Arnaud Clement as the second singles player in the absence of the injured Jo Wilfried Tsonga but elected for Simon who has played just three ties in the competition. Llodra had a 29-21 singles record this year with title triumphs at Marseille and Eastbourne. Llodra and Clement will team up for Saturday's doubles rubber against world number 30 Troicki and Nenad Zimonjic. Forget, who has Richard Gasquet as "fifth man", said he was blessed with more options than counterpart Obradovic. Tsonga is sitting out this weekend's Davis Cup final through injury, but will travel to Belgrade to cheer for France against Serbia as a team spirit second to none could once again help them pull off an upset. 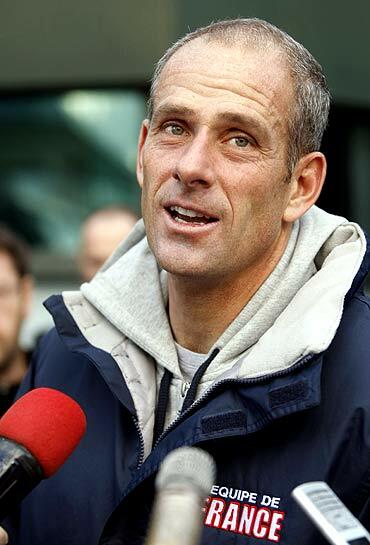 French Davis Cup team captain Guy Forget said his country was ready to upset Serbia and their patriotic home crowd. 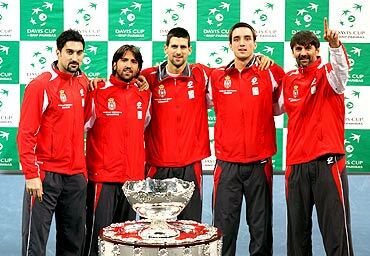 "We are not afraid of anything, we know how good Novak (Djokovic) and the other (Serbian) boys are," Forget told reporters. "We also know that when you play away the atmosphere is sometimes hard and you have to be ready. "It's going to be a great match, a tough match and you know we are really looking forward to it." Forget, who led France to triumph as a player in 1991, suggested Serbia were relying on Djokovic. "One of our strengths is Tsonga was our number one player and hasn't played the last two matches," Forget said. "These guys have been able to make the finals without Jo. "I don't know if Serbia could have gone to the finals without Novak."